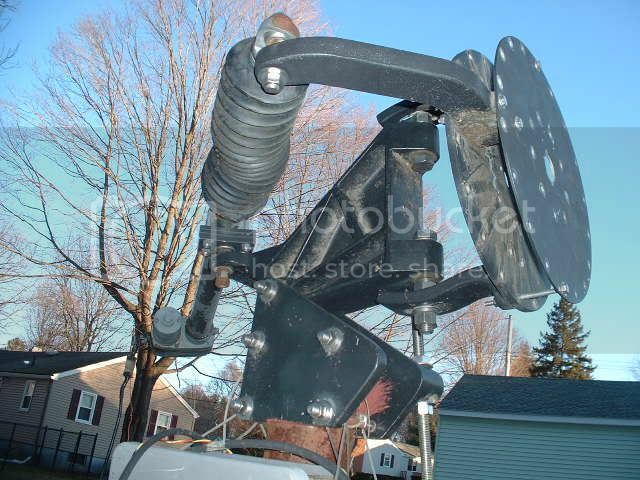 I have a 10.5 foot Sat TV dish that I plan to strip down and convert into a solar tracking mount for a PV array. the house isn't going to block noon time sun, even when it's at it's lowest point of the year. I've started the project by ordering some bits and pieces. 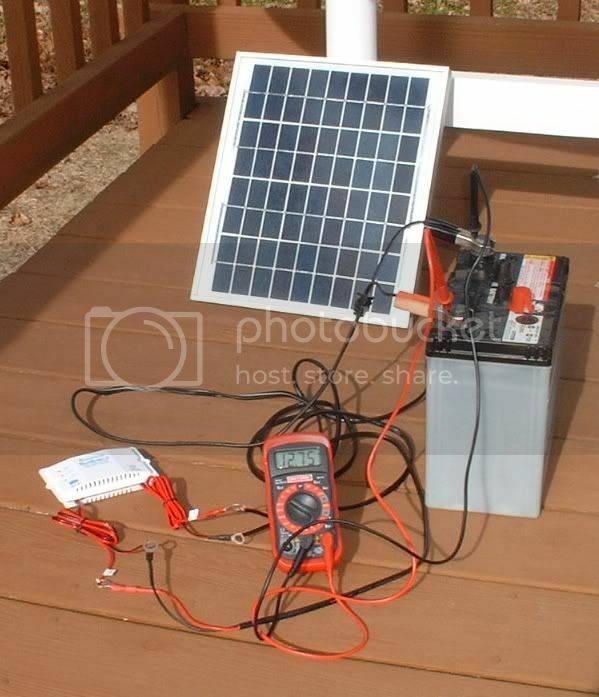 One small PV panel to charge the battery-power supply for the tracker PCB/motor. 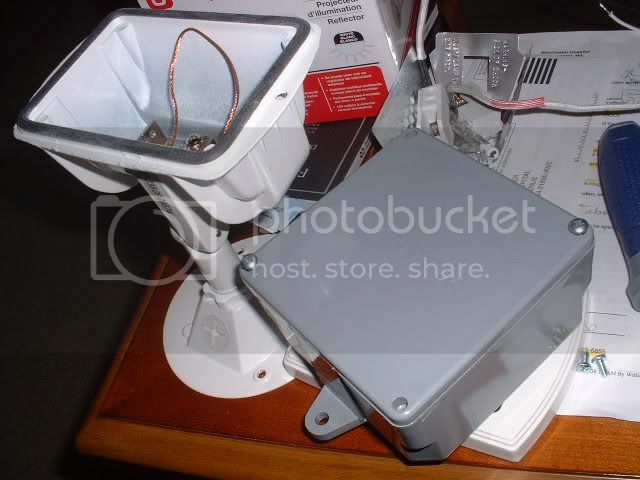 One sensor case: (An outdoor lamp housing from Lowes). It's been hacked. It's set up for elevation only. 1. The dish has to be returned to it's original config. And, all the mesh and those long dish arms will be removed. 2. 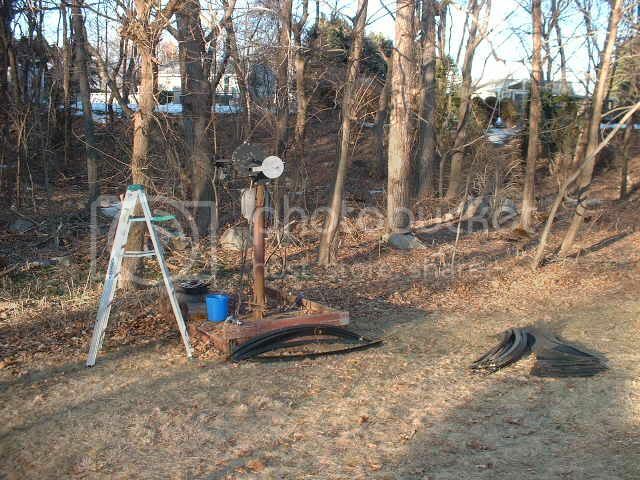 A steel rack will be installed, as the foundation of the PV rack. (I sawed up a brand new king sized bed frame. It was free). 3. Assemble the tracker PCB. 4. 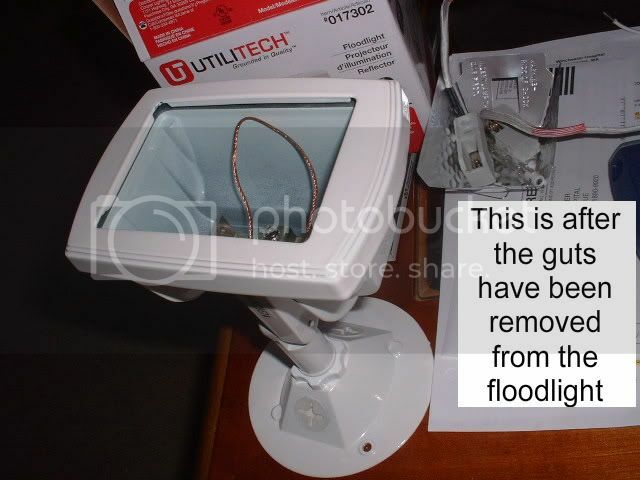 Build a light sensor board and install it inside the water proof lamp unit. 5. 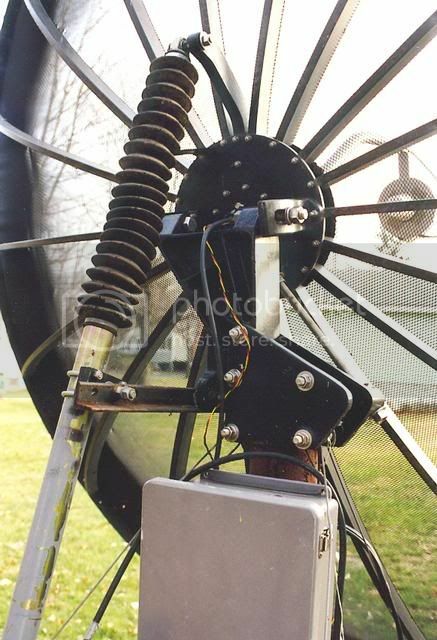 Plan, build and install water resistant limit switches on the mount, at the point of rotation. 6. Select and install a Charge-Regulator-Controller between an old 12V car battery and the new PV panel. 7. Put it all together and get it tracking the sun. 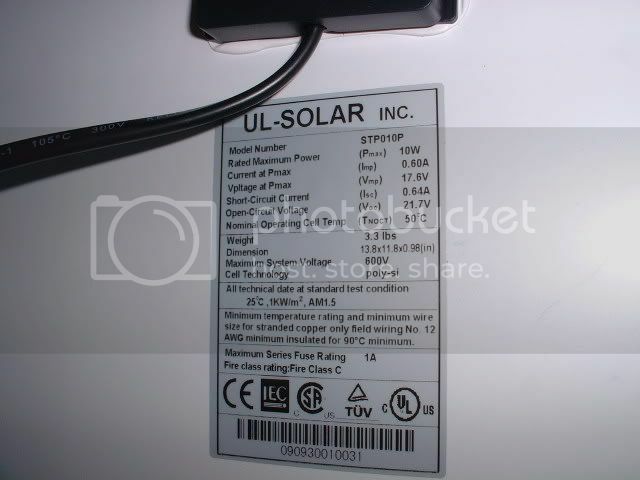 If proves to be reliable, then select, purchase and install some PV..
the $20 price this morning.. Now, I'll be getting two of them..
(I've got two 12V batteries). don't bid, but just make a low-ball "Best Offer" on a Buy it Now and see if you can get one for 10 or 15 bucks! Edit: They decided to ship both units in one box, and I may be getting 3, due to a mistake.?. One of the Ramsond units came in today. It's smaller that I expected. Very compact. The PV panel came in today. Appears to be good quality. I should have ordered more. 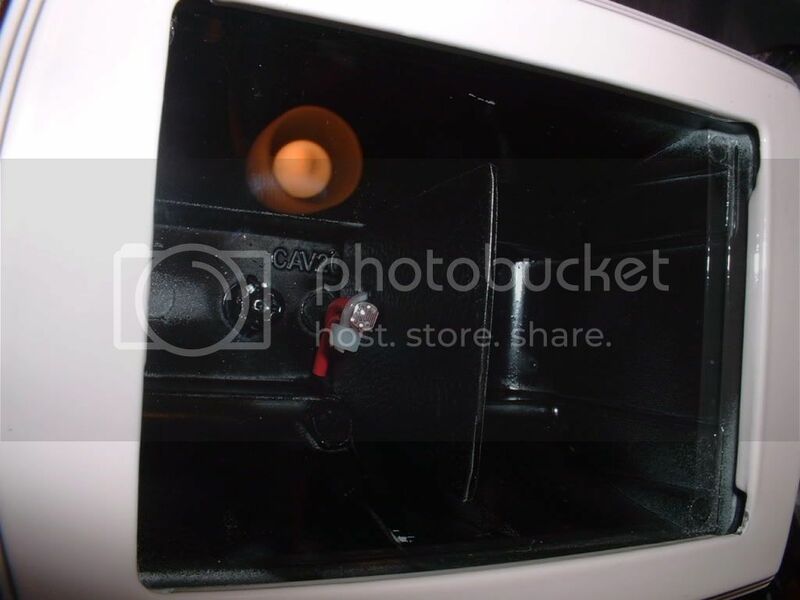 A quick test with a 12V tail light showed 10.8V at 0.55A. The OCV was 20.8V. So, I think it's going to work. 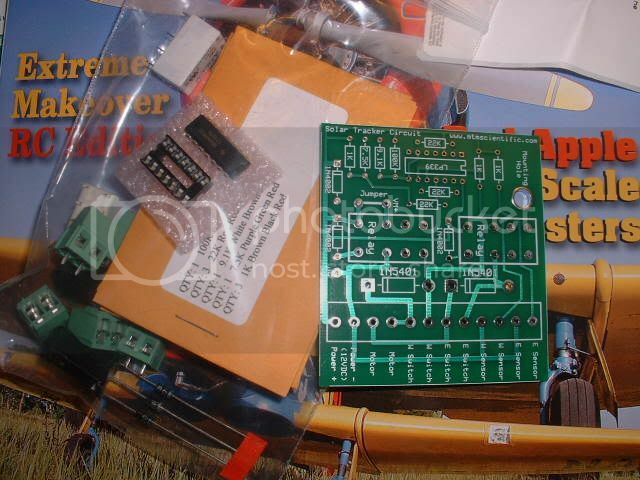 Assembled tracker PCB. Still working on optical unit. Disassembled dish and started reconfiguring the mount for sun tracking. It was about 40 today, so I stripped the antenna off the mount. This is the east side of the mount with the elevation screw. 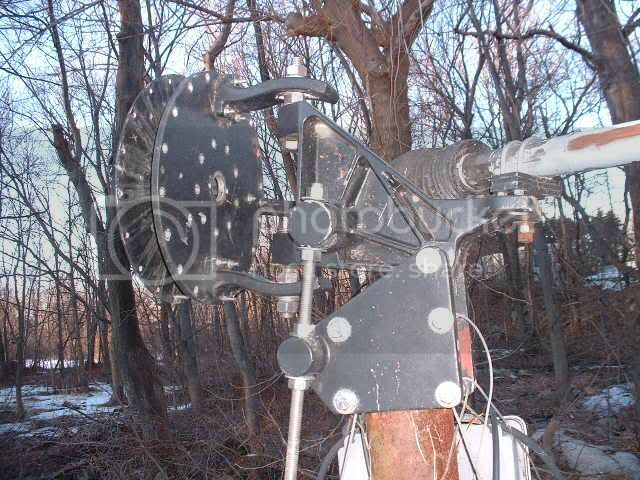 This is the west side of the mount, with the actuator jack screw/motor and actuator arm. and twist the mount to the south. I'm not seeing an easy way to install the limit switches.. Tested the new charger and it seems to be working so far..
Optical Sensor (Divider wall in center). Top view of optical senor. Currently debugging the PCB. It only wants to go east. (But both light sensors seem to be working fine). the sensors need to see direct bright sunlight. If it's a little hazy, the tracker motor just stops. I'll have to install everything on the mount and run it a few days before deciding about making a mod to the reference voltage. 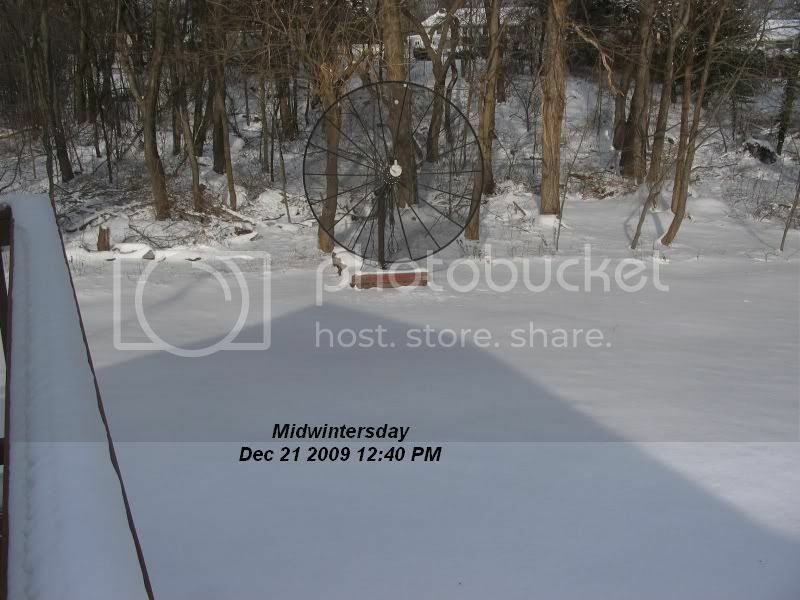 Last edited by Xringer; 02-14-10 at 06:19 PM.. Reason: test results"
I've studied the limit-switch problem for a week and I've decided that whatever I add on to the mount is going to be subject to failure, due to sun exposure and/or winter icing. 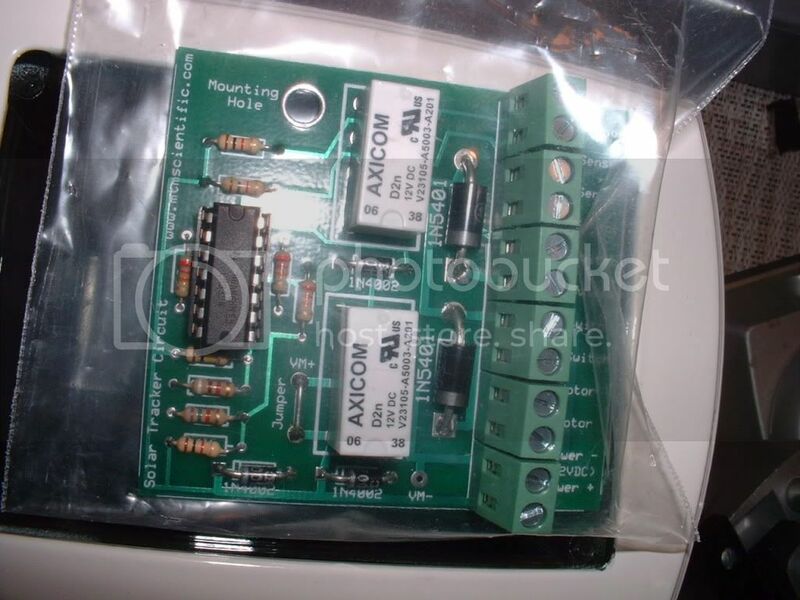 I think the best solution is to buy an actuator with built-in adjustable limit switches. Faster and easier too. This one has a lot of power and should be able to do the job. Found it for $109(shipped) on ebay.. Is there a similar unit around for less? Feb 22, pulled the trigger on this item. Ebay is going to ruin my retirement account!! Feb 23.. The Actuator is in the mail (UPS). March 4, replacement Actuator came today. With a little tweaking, the end-limit switches operate correctly, this one is a keeper. It came with a UPS label to return the bad one. It's ready to go. the width (~41") of the more powerful panels is going to be a problem. to fill the racking foot print. Which I think is going to be about 8x10 feet. Due to the short post, the center of mass is only about 6' off the ground. Last edited by Xringer; 03-04-10 at 03:31 PM.. I'm looking forward to following your progress. I've been thinking about building something similar for a solar hot water project large enough to provide heat for my house. Welcome to the site Jeff! Would you care to share your project with us? We'd love to hear about it. Thanks, Daox! I'm still in the planning and parts-gathering stage. Once I get to building it I'll definitely post it up here. Today, I'm waiting for another actuator to show up. The first one has some limit switch issues. 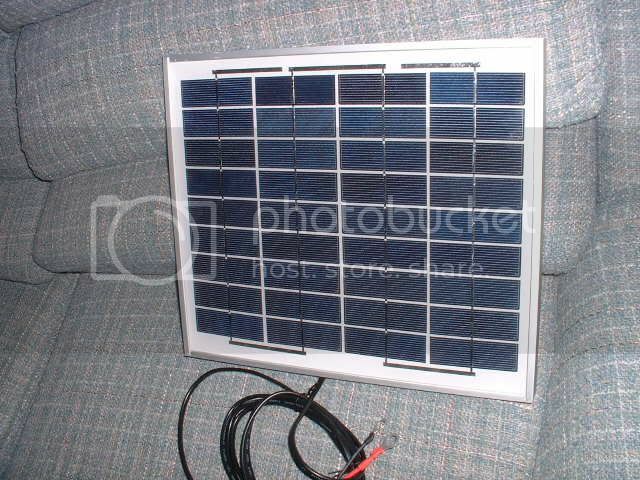 I have located a 120w panel that might be good for a 12V back-up type system. The min-order is 2, so I would have a little over-kill with 240 watts.. Most of the better panels at this site have min-orders of 20 or 100..
Total cost with shipping looks to be about $707 which is less than anything I've seen lately. 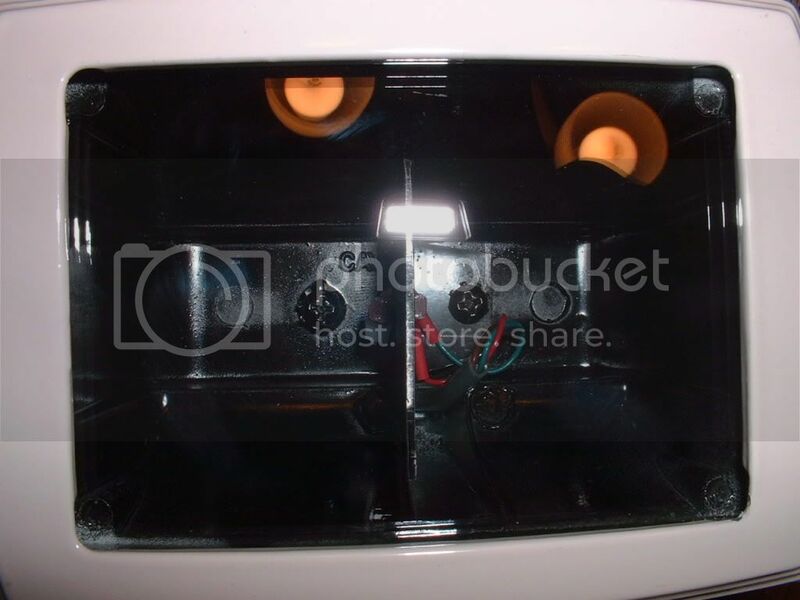 This panel was about $200 more back in the summer of 2007. These smaller footprint panels should be a good size for my mount. Also, how did I miss this thread?!? This is a great project so far. Love to see what comes next. Xringer: The first iteration of my project will be grid powered. I'm also thinking that single-axis tracking will be sufficient - I'll just set the tilt to match the winter sun angle. Thanks for the link to the 120w panel. I eventually want about 2500kW of solar panels, 1500w-ish wind generator, and gridtie inverter. We bought a house on a cleared acre just before this last Thanksgiving. I also have plans to build a two-story 24x30 detached shop/garage this summer. On the subject of dump loads, I've always thought it would cool to have a programmable dump load controller that could route the power to a number of different things - vehicle engine block heaters, a domestic hot water heater, hot tub heater, etc. This way that surplus electricity could be put to some really good use. I don't know that such a thing exists, but maybe some quality time spent with an Arduino would do the trick.